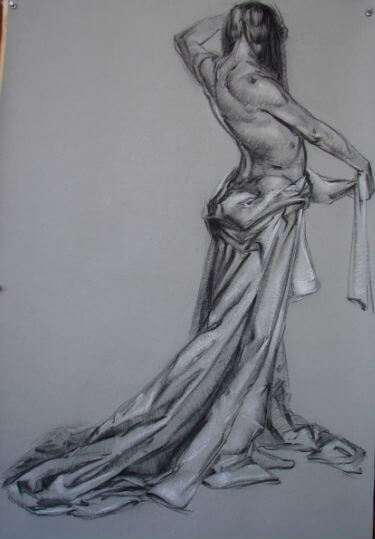 This week I will be giving a workshop at the Woodstock School of Art on the use of drapery and its relationship to the figure. Very little attention is given to the expressive quality of drapery. In most cases it is a mere still-life within the larger framework of the composition. But when one observes the use of drapery in the masters, one can see how every fold in the costumes and drapery of every sort is given minute attention. The drapery acts as a means to enlarge upon the expression and gesture of the figure. It adds force, rhythm and beauty to the underlying emotions. It intensifies and clarifies the idea of the artist. It also acts as a compositional element carrying one part of the image and uniting it to another. It becomes the music and tone, a stage upon which the figure will act. The figure remains the principle character but the drapery adds grace and dimension to the piece. Although drapery can reinforce the movement of the figure, it can also act as an independent force- an element of conflict and resistance, a force to be dealt with. It can also carry the power of an element (such as wind, fire or water) and can act as a source of energy which is difficult to describe. It can also carry more hidden, unconscious or intuitive impulses. It can act as a character in its own right. When I started to take drapery seriously, it opened up an aspect in my work that was more impulsive- revealing an element or character within myself that was seeking form but was not as descriptive as an object. How does one describe a force that is felt but not seen? The work of Rubens contains this undeniable force. Drapery carries his consuming sense of movement- that which is within the subjects themselves as well as forces that lie without. The drapery unites these elements tying the serpentine compositions together and intensifying its emotional impact. We are pulled into the image and partake in the action.